Black Mill was the last of a long line of windmills on Barham Downs; there was a mill here in the thirteenth century. A mill was marked on Philip Symonson's map of 1596, John Speed's map of 1611, Morden's map of 1695 and Bowen's map of 1736. This mill was originally a little lower down the hill, and was moved to a new position higher up. In 1796, as part of a brief national movement to erect mills to grind flour for the poor of the parish, a subscription mill was built on Barham Downs. Its establishment led to local millers lowering their prices in line with the cost of wheat .In 1798 it was reported that the parish mill on Barham Downs had cost only £353 to build, only £33 over the proposed budget. It was built with two pairs of stones, and the proprietors had expressed after seeing the parish mill at Chislehurst, that their mill ‘had been built on a larger scale’. Interestingly the name ‘Black Mill’ seems to have been adopted much later in the first half of the nineteenth century. 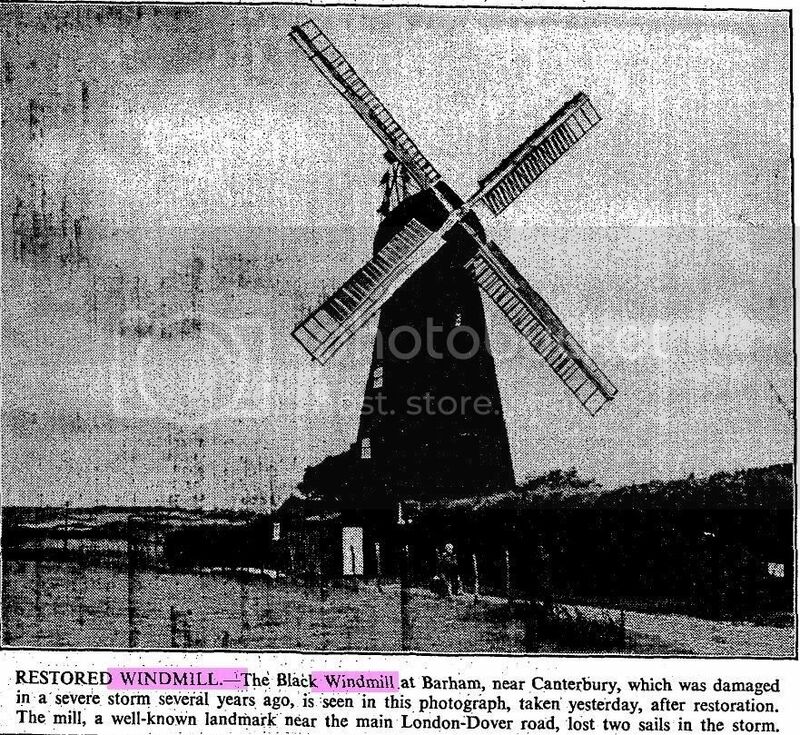 A ‘White Windmill’ is mentioned here in a report on troop exercises on the Downs in 1804, so at some point after this, the windmill changed colour and name, probably due to the cost and durability of white lead paint over tar. As with the other ‘parish mills’, the original good intentions were replaced with need for commercial profit and the mill was let to millers, the most prominent of which was a Mr Lawrence who worked the mill for many years. On the 6 June, 1854, tragedy struck, and the mill was burned down. The mill, in Lawrence’s possession was ‘discovered to be on fire,.. occasioned by the friction of the machinery’. The glow of the fire was visible from Canterbury. Lawrence was insured, and had been letting the mill to Frederick Longhurst, who died around the same time as the fire, although there is no evidence that his death and the fire were linked. Tradition states that the Black Mill was built by John Holman in 1834, although the above proves this highly unlikely. He may have built another mill in Barham at this date, but it is very doubtful it was this one. The mill was well insured and quickly rebuilt, and in October, 1854, following the death of Longhurst, the premises were being advertised for sale, although the new mill was not due for completion until March, 1855, and consisted of an ‘exceedingly powerful new built corn windmill with patent sails driving three pairs of stones’ . No documents exist to confirm implicitly that the mill was built by Holmans, but its style and features would suggest so, in which case it was probably built by TR Holman, and not John. There is no documentary evidence to confirm the milling empire of Pledge and Son began here either, the mill being advertised for the best part of two decades for sale or lease on a regular basis, suggesting that a succession of journeymen millers came and went without success until Richard Walter in the 1870s, who leased the mill for half a century, and built it up to a credible business with a steam mill attached. In the 1920s, the mill was bought and worked by T Denne and Sons. In the autumn of 1936, the mill was damaged in a gale, which smashed the fantail, and led to the leading edge shutters being removed over the Winter. In early 1937, they tried to sell it in this condition for £1500, with the understanding that it would not be worked as a mill for 10 years (!) In 1945, Edward Mannering, the retired Dover miller, bought the mill, and immediately rebuilt the fantail, using the blades from Willesborough Mill. In 1951, two sweeps fell, and a year later one of the middlings failed. With the assistance of a £400 grant from Kent County Council, Mannering replaced the sweeps in 1956, and by 1961, the mill was to be seen freewheeling regularly. The work was done by Holmans of Canterbury, the last windmill work they did before the firm stopped doing millwrighting. Mannering was awarded a Windmill Certificate by the Society for the Protection of Ancient Buildings for his efforts. The mill featured in the 1955 film "Raising a Riot" starring Kenneth More. The mill was purchased by Kent County Council in the late 1960s and burnt down on 3 March 1970 when a spark from a bonfire set light to the mill, burning it down to the stone floor. A further fire later in the year destroyed what was left, and the base remains, as does a memorial in the village, consisting of the iron wallower, upright shaft and spur wheel, removed from the remains some years later. There are many great pics of this mill, sadly burned down in 1970 whilst KCC were restoring it. Thanks Kyn. This is the first pic I have ever seen of this legend. S4.